Where are you based? Which areas do you cover? Although we are based in the beautiful city of Leicester, we regularly shoot weddings all over the United Kingdom, going as far as the North of Scotland. We also love to hear from couples who are planning to get married abroad. We are happy to provide wedding photography literally anywhere in the world. When can we meet you? We are happy to meet in person before you make any bookings. We can bring along examples of our work, answer any questions you may have and help you create the best package and price for your wedding. There is no pressure to make a booking at this meeting. If you live far away, we can always arrange to meet over Skype. How many photographs of our wedding will we get? This varies from wedding to wedding and we will never limit the amount of photographs that are take or edit. Our priority is providing a high quality and comprehensive cover of the day rather then taking a certain number of shots. However we also believe in quality rather then quantity. We find that we usually shoot anything up to 2000 photographs and select the best 400-800 to edit and deliver to our clients. What do you wedding photography packages include? Each and every wedding package is created bespoke and tailored to the needs of each couple. A typical package will include the following. We would love to be able to provide a simple answer here, as we know it’s one of the first questions that spring to mind. There are too many factors, however, to be able to set one price for all of our weddings. Each and every wedding in unique and the price is impacted by factors such as your locations, traveling distances, the length of your wedding and your individual needs. Please feel free to contact us to discuss your wedding and get a price. Do you offer pre-wedding / engagement shoots? We do and we love them. It gives you a great chance to begin to feel comfortable behind the camera and know what to expect on your wedding day. Engagement shoots can be used on wedding invitations, for a slideshow at your reception or simply to post up onto Facebook and Instagram. But most importantly, an engagement shoots allows us to begin to develop a friendship with you both before your big day. When long do you stay for on the wedding day? As long as you will let us. We are willing to fit around your plans, but we usually start with the bridal preparations and shoot throughout the day. We don’t usually set a finishing time as our main priority is capturing stunning photos that you will cherish for the rest of your lives, not checking our watch. After shooting right into the evening, we usually only leave after we have some good photographs of your friends and family dancing. Yes and we take this very seriously. We will never shoot a wedding without professional indemnity, public liability and equipment insurance. What happens if you fall ill? To date we have never missed a wedding and we hope to be able to hold on to that claim throughout the rest of our careers. It would take serious hospitalisation to keep us away from shooting your wedding, but it the unlikely event of this happening, we have a network of other wedding photographers to call on. We can either supply you with another photographer (one we would trust to shoot our wedding) or provide you with a full refund. How soon after our wedding will we get our photos? We have very high standards and take great care in the post production work of your photographs. Each and every photograph that we deliver is worked on, paying close attention to the colours, tones and basic retouching. We don’t outsource this, we edit each and every wedding ourselves so that we can give our photos the time and attention to detail that they deserve. Thus we usually take 6 to 8 weeks to prepare your photographs for you (although depending on the time of year, this can be significantly less). If you need a couple of photographs sooner, for example for thank you cards, we can provide you with these within a couple of days of the wedding. Will you keep a backup of our wedding photos? We keep multiple backups of all our weddings. We promise to keep them for at least 2 years, however we still have copies of every wedding we have ever shot. Do you give us the copyright? It is a very lengthy and long winded process to provide you with full copyright, just saying we do doesn’t prove anything. It also limits our legal protection as your photographer. Thus we don’t provide you with the copyright but provide you with a USB stick of high resolution photographs along with full printing rights. Your photos are yours to cherish for a lifetime. You can print them whenever or wherever you like and share them with your friends and family or on social media. All we ask is that you don’t sell or reproduce our photographs without our permission. It takes a deposit of just £250 for us to hold your date. The next payment of 50% is payable ninety days before your wedding. The final balance is payable no later then two weeks before your wedding. Any prints, albums or extra USB sticks that are not included in the wedding package can be paid for when you order them. If I cancel my wedding, will I get a refund? Unfortunately in most cases we are unable provide a refund of any payments already made before the date. As soon as we get your booking and deposit, we hold that day exclusively for you and turn down any other commissions for that date. We also start to make all necessary plans well in advance. If you reschedule your wedding to another date that we have free, we will do our best to cater for this and move across deposits already made. Do you shoot every wedding as a couple? Not necessarily, but we do like to if at all possible. This will be discussed and confirmed before you make any bookings. We love each other dearly and work together well as a husband and wife team. We find that by doing so we can capture more angles, get both a masculine and feminine prospective of your day, shoot both the bride and grooms preparations, make your formal group photos run like clockwork and provide a much better collection of photographs. 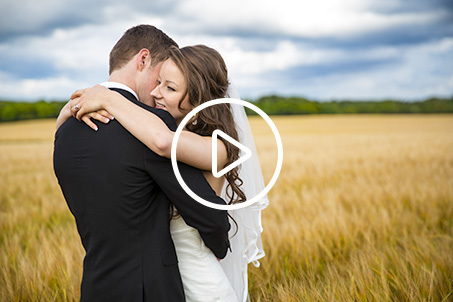 Which equipment do you use for wedding photography? We use a number of professional Canon DSLRs and lenses. We also have a large range of lighting gear to be able to select the best options for each wedding. In addition to this, we also try to have a backup of everything to hand. When and how do we book you to photograph our wedding? If you already have a specific date for your wedding in mind, we encourage you to book as soon as possible to avoid disappointment. Many couples book over a year in advance. If you would like to book, we can send you a full quote along with a guide and our terms and conditions. Your booking is made and your date held when you provide us with a £250 deposit towards your day. If you have any questions about this, please feel free to get in touch with either of us. What if we are nervous and don’t like posing? You are far from alone, the majority of brides and grooms that we work with feel this way. We want you to enjoy your wedding day and have picked up a number of skills to help you have a fun and relaxed day. We have been told that we have the unique ability to be able to make people feel comfortable behind the camera. Although at times we give some direction on how to stand, we don’t believe in rigid posing but rather aim to capture real moments and emotions.